Final week of the NFL season and there are not a lot of great games to bet on. There isn’t much on the line this week outside of Colts v. Titans, so I don’t see the games being played with a lot of heart. There will be sloppy play and a lot of backup induced upsets. But of course, bets will be made and my predictions will be shared, let’s go. Patriots yet again are a 2 touchdown favorite against the Jets. Last time the two teams played, the Patriots won by two touchdowns on the road. Now at home and with the defense playing much better, they should be able to do the same again. Bill Belichick has never lost a game against a rookie quarterback and wins by an average margin of 12.5 points. With Sam Darnold starting and the Patriots trying to clinch a first round bye, take the Patriots. I think this is going to be a very good defensive game. Ravens have shown all season they are one of the best defenses in the NFL and will be able to stop a Baker Mayfield led offense. Cleveland has a very good young defense as well and can keep up with Lamar Jackson when he decides to put his head down and run. I see a lot of first downs in this game and very little big plays. The clock is going to run causing a low scoring close game. I think the Browns are going to cover the Spread. The Chargers are feeling terrible after the loss last week to the Ravens; I expect them to run wild on the Broncos. Philip Rivers is embarrassed about his teams performance and will try to make up for it by getting the first seed in the AFC this week. 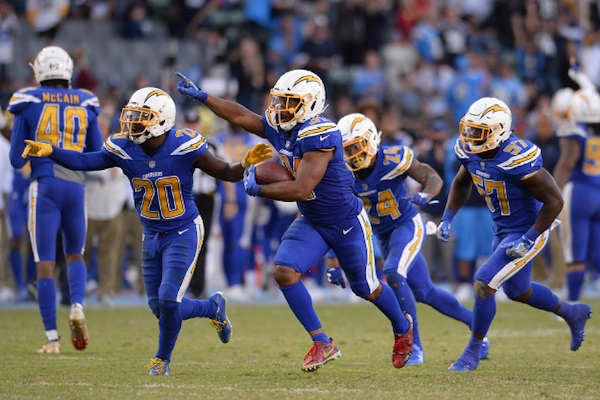 Although Denver has played well all season, I think the Chargers have the best roster in the NFL. They should be able to have their way: scoring a lot of points and making a lot of stops. Take the Chargers. The Rams are clearly the better team at every single position. The only position you can argue about would be head coach. But that is not going to be enough for the niners to be in this game. I think the Rams are going to put up a lot of points on them. And I think the Rams are going to win this game by at least 2 touchdowns. This is my favorite pick of the week. LOCK. This is going to be a really good close game. I still think that Andrew Luck and the Colts are going to win, but I think the Titans have a good enough defense to keep this close. Because this is a win and get into the playoffs game, both teams are are not going to give up anything easy. When I first saw this was more than 3 points I jumped right on it. It looks like this is going to come down to the final field goal to end the game. Take the Colts to win but for the Titans to cover the spread.